I love the chance to snoop without repercussions. Don’t you? Today, you get to snoop in my medicine cabinet. Heck, I’ll even give you a tour. Yes, this cabinet is not the prettiest one you’ve ever seen. It needs some new paint, and, well, it needs to be cleaned. There you go – some dirt on me! Stub of a candlestick (faintly visible white thing). I have no idea why anyone would keep the stub of a candlestick. Perhaps in the event that the power goes out and I forget entirely how to get back to the rest of my apartment? Sink plug which I only ever use if I need to soak something in the sink. What things I might soak in the sink I don’t want to say. Vapo-Rub, or, should I say, Rexall’s Vapourizing Chest Rub. Yes, there are still people that have this product. No, I don’t use it. Hardly ever, anyway. But I do have some very comforting memories of my mom heating flannel cloths in the oven on cold winter nights, rubbing our chests with Vick’s Vapo-Rub, and then tucking a warm cloth between the mentholated goop and our pj’s. Ahhh. Matches. To light the candle stub, of course. Ahem. Two cheap-o plastic containers that contain a bunch of junk I never use and practically never look at, including white nail polish, tongue studs from way back when, dental floss (don’t tell my dentist), and old cheap earrings. Oh, and nail clippers, which I do tend to use regularly. The tiny white package on the very left is a sample from Sephora that I haven’t opened yet. I may never open it. Thus begins the gamut of my skin care regimen by Aloette (which I really enjoy and would definitely recommend): the night cleanser (Essential Cleansing Oil), which does a bang-up job of taking off make-up, too. Toner is next. I am so fascinated with how the cotton pad can come off that particular shade of scuzzy grey, even after I have just washed and rinsed my face. That lovely light pink stuff is actually body lotion, called Hand and Body Silk. It’s pretty fantastic: smells refreshing, rather than perfume-y, and is especially nice if you use it as a shaving lotion on your legs, though I’ll warn you that it will clog your razor. Crammed in next to each other there are lotions, one for day and one for night. I use the lotion for day, because otherwise my face gets too oily. The creme is for night – it’s thicker. Yes, I do think it’s worthwhile to have two creams, especially during the winter, when skin tends to get a bit scaly. A thick night cream helps prevent that flaky skin that I tend to get around my nose when I have a cold. Tucked in behind the lotions is Moroccan Oil, the newest addition to my beauty arsenal. It’s a very popular hair product that many swear by, though I’m not convinced it’s for me. Shame, because it cost me about $40. The tiny tube is eye cream. I’m guilty of not using it every day, even though my mother said I should. It’s just one extra step that I keep thinking isn’t really necessary… yet. When I get crow’s feet, I will wish I had been putting it on every day since turning 5. The small bottle with a pump is called Time Repair Serum. I think it’s to prevent my skin from aging, but in the meantime, I feel like it helps keep my skin nice and smooth. Or maybe that’s the same thing. Behind the Time Repair is Visible Aid, a first-aid cream that really does a great job at helping heal cuts and scrapes and burns. Thus ends the Aloette parade. Next in line is a character that needs no introduction, other than: “nausea, heartburn, indigestion, upset stomach, diarrhea,” the latter of which, of course, a lady never gets. Hidden in the back left corner is a shine product for my hair which I obviously never use. But should, no doubt. Next is something that could be slightly embarrassing because it’s not something most people would buy: a crystal deodorant stick. I got it from a health food store, then stopped using it because, well, I like Degree antiperspirant a lot, and had always used it. But, a couple of VIPs in my life reminded me that it’s worth it to not smell “shower clean” in exchange for using something that hasn’t been linked with breast cancer (antiperspirant, FYI). So, I made the switch, and only use antiperspirant if I have forgotten deodorant somehow. It’s different, sure, and has no smell, but it really works, and I feel much better about the whole scenario. Worth a try, both for men and women! After that whole diatribe about MY deodorant, here’s a spare stick for my boyfriend. Sometimes, you just need an extra dab or two. Clearly, my cotton supplies are low. Typically, those three jars contain, from left to right, cotton pads, Q-tips, and cotton balls. I need a trip to the drugstore. The bottle in the corner with the pink on it is an ear-care product that has gotten me through several infections. Available at Claire’s, I believe. And front right, a generic cream to help heal scars. Exotic, right? 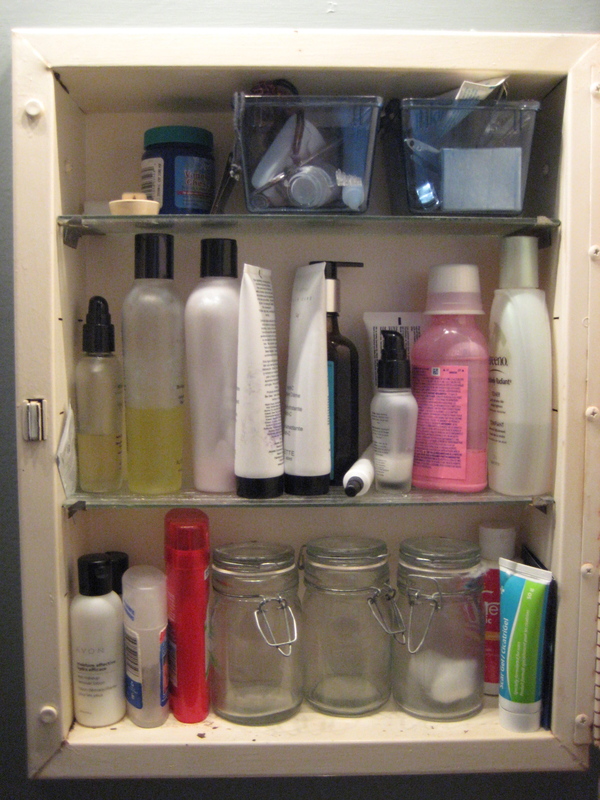 There you have it: a sneak peek inside my medicine cabinet. Nothing crazy. And now you don’t have to worry about being caught in the act someday when I throw a dinner party and put marbles inside the medicine cabinet to embarrass the snooper. YOU’RE the “dirty birdy”, not me (thanks, Clinton Kelly, for that fabulous idea).